Professor Philip Alalibo, a Nigerian political scientist and professor in Canada, publishes a bestselling book on African poems. 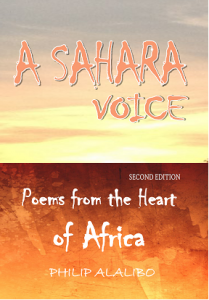 In this collection of insightful poems, Professor Alalibo’s intellectual sagacity is brought to bear in his poetic offerings that underscore his political, social, cultural and racial experiences that traverse two continents, Africa and North Amer ica. This book liberally employs the use of descriptively rich language, lyrical as it is in its utter fluency, to simplify intricate and seemingly lugubrious poetic concepts. This is a must read literary work that puts into perspective the human experience and the existential burden of the African man. This work appeals to the literati and all those who have a knack for fine poetry crafted intuitively. For your copy, contact the publisher at info@shidaanikei.com. Visit publisher’s website at www.shidaanikei.com.